Calling all salsa lovers for Mexican chicken dinner which needs only two humble main ingredients - chicken and salsa and just 5 minutes to put together! With this recipe, I'm giving you an easy, I mean, seriously super easy chicken dinner recipe. This is a kinda recipe which you can put together, right now.. I mean right this minute. 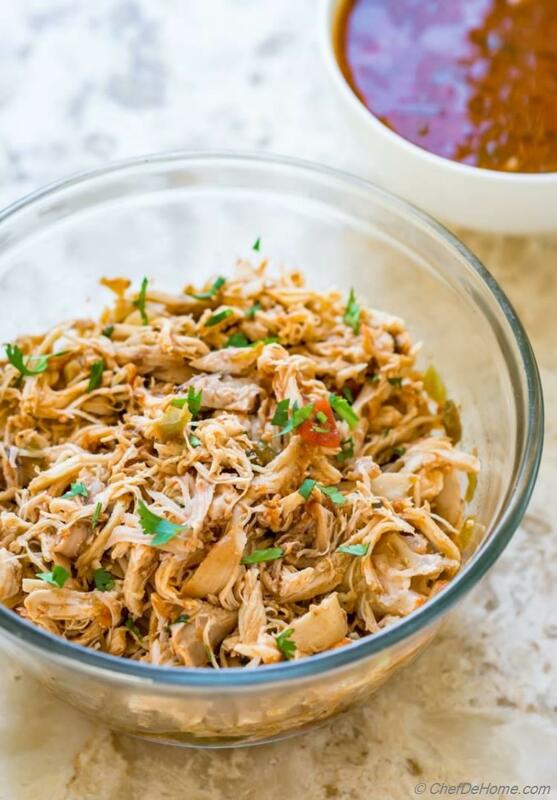 Just if you have few simple spices in pantry.. then this 5 ingredients crock pot salsa chicken is actually 2-ingredients recipe. Mainly, all you need is: chicken and chunky salsa. That's it! I have been cooking chicken in slow cooker for quite sometime now and salsa is something I always have in refrigerator. But honestly, I never thought that combining these two ingredients can make a flavorful shredded chicken for dinner.. Fill it in tacos, serve with rice bowl or even top on pizza .. it works perfect either ways. Oh, and any leftover will make salsa chicken quesadilla for breakfast too. My special favorite thing about cooking Salsa Chicken in crock pot is kitchen smelling like Mexican Cantina. No kidding! These two when slowly simmer in crock-pot... a flavor-magic happens. Exactly like when you enter a Mexican restaurant (specially ones which have open kitchen) and first sniff is that aroma of meat simmering in garlic, tomatoes, chilies and spices... corn tortillas. Exactly like that! Even though this recipe does not call for corn tortillas. :) But, you get the point. right? Since Chicken Salsa is humble 2-ingredient... it is important that for good flavor, good quality chicken and salsa is used for this recipe. Even leftover or homemade fresh salsa will work but it should be flavorful. I use chunky and medium spicy salsa so that every one can enjoy the same dinner - I mean those who don't like spicy and also those who like spicy (with some pickled jalapeno on side). I had been seeing a lots of salsa chicken on Internet lately and was thinking to try this recipe since long. However, first I wanted to try the recipe with minimum effort.. just to see how it turns out. 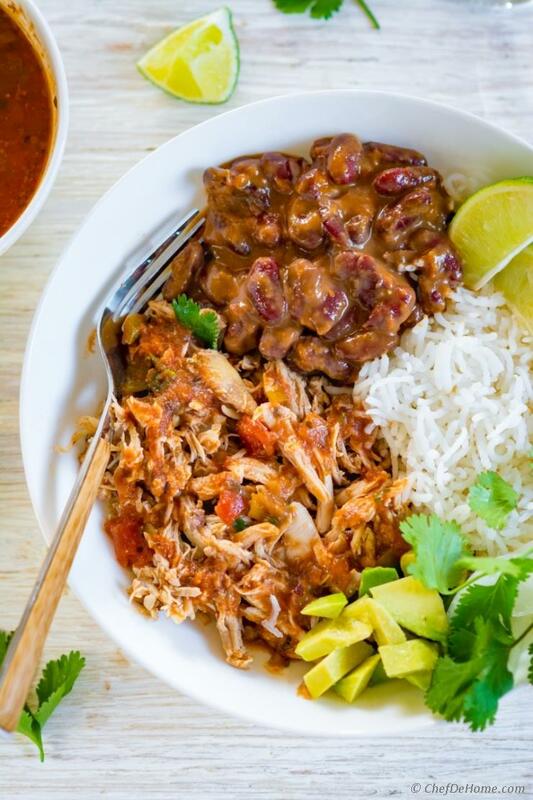 What is better than a slow cooker to test a shredded chicken recipe? So, for my first try I threw one pound of chicken with 1 cup of medium salsa in crockpot. We had some errands to run that day. When we returned home after few hours... the first positive reaction was - delicious Mexican flavors filled kitchen. Just entering the main door made me feel good about the recipe. After trying the sauce, I found it has room for some more flavor without breaking the bank... I mean by using some spices from my own trusty pantry. So, in next attempt, to add more flavor, I added some staple Mexican spices - cumin powder, oregano and little honey to balance the tartness of salsa. Since we are not that "Medium Spice" family.. I also added a bit of chili which is just for us, so I have not included in the recipe ingredients. I liked the slow cooker method of cooking salsa chicken SO much that, this is what I will share, I told myself. 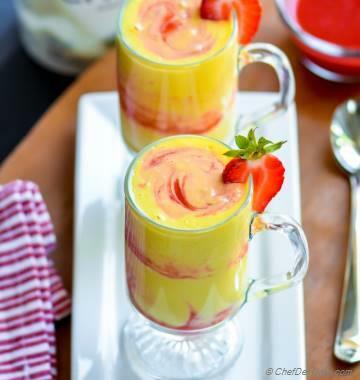 In meantime, this recipe has made a special place in our menu. When I have some salsa to spare and a busy day in week.. 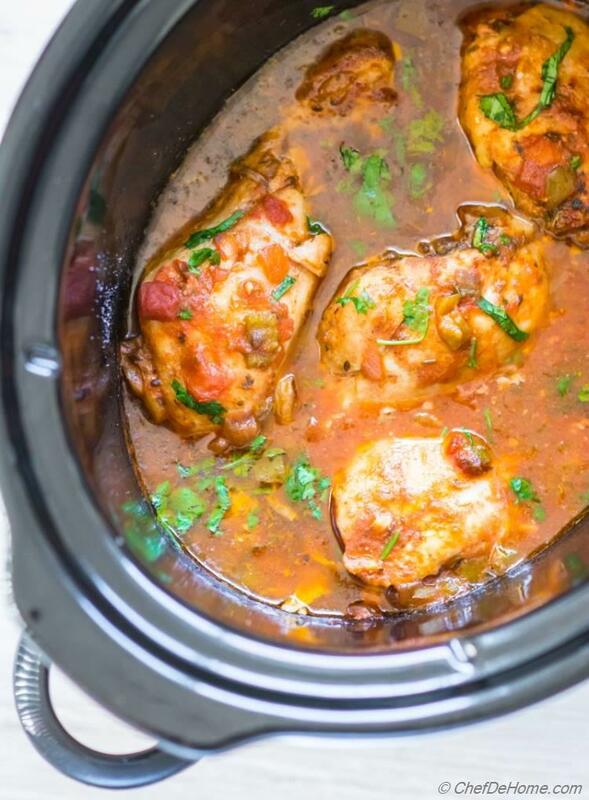 I'm loving adding some chicken and salsa to crockpot. When planning to serve with rice, I also add a little bit... say 1/4 cup of chicken stock/water to increase the amount sauce that works well to soak in rice in some flavor. 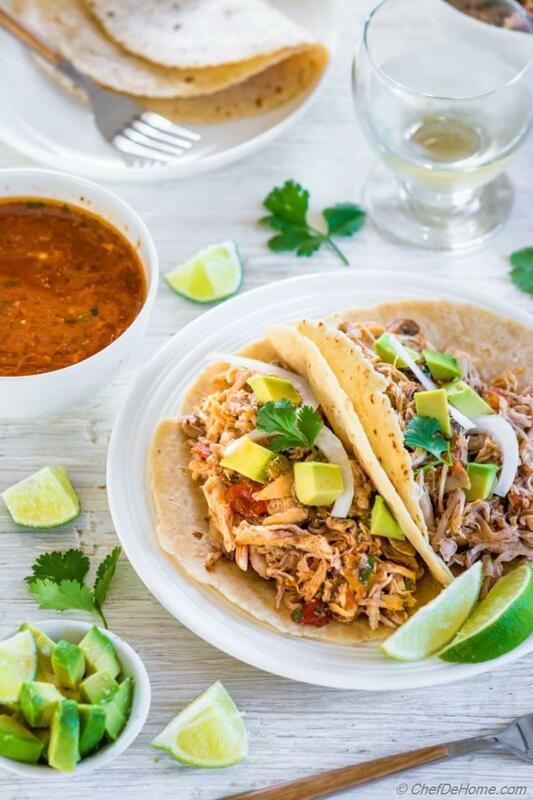 I would not recommend adding stock/water if you cooking shredded chicken for tacos. Now, I must tell you that this recipe even works well with frozen chicken. Voila!! Seriously, since chicken does not require to be seared or par-cooked, you can actually dump-in frozen chicken, spices, and salsa in crockpot at night. On low, add 1 hour for chicken thaw time and 5-6 hours for cooking it. Which means in 7 hours you will have salsa chicken ready to serve! How about that? Friends, I recommend grab some salsa and chicken from store today. Tomorrow, for taco night, let the crockpot work for you. A super easy meal for for flavorful Mexican Tuesday will be waiting for you in the evening. Total Time 5 hrs 5 mins Prep Time 5 minutes Cook Time 5 hrs 0 mins Difficulty Easy Yields 3-4 Servings Serves 4 Notes No. 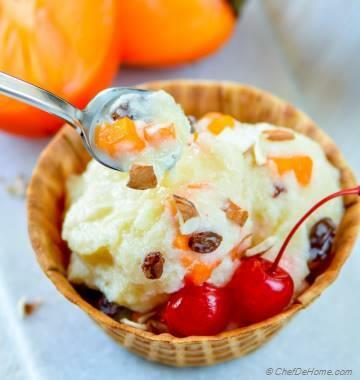 of servings depends on serving size. Smart Swap How about a Salsa Chicken Verde?! 1. 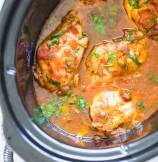 In crock pot, add chicken pieces. Season with generous pinch of two of salt. 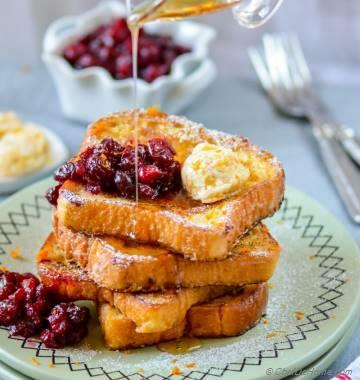 Sprinkle oregano, cumin powder, and drizzle honey on top. Pour salsa covering the chicken. If you like little more gravy/sauce for serving with rice. Add 1/4 cup of water/chicken stock to the pot. 2. Cover and cook on low for 5-6 hours on low or 2-3 hours on high. 3. Once cooked, remove chicken from pat. Shred with forks and add back in the sauce. Or you can serve sauce on the side to pour over rice/drizzle over tacos. Serve and enjoy! Courtney, I'm glad you enjoyed this chicken. It actually taste amazing!